Ethel R. Lawrence Homes is an award-winning affordable rental apartment housing complex located in upscale Mount Laurel Township, about 30 minutes from downtown Philadelphia. The development, which boasts spacious one-bedroom, two-bedroom and three-bedroom units on 62 attractively landscaped acres, has long been recognized for setting the gold standard for affordable housing in communities of opportunity. In 2008, Governor Jon. S. Corzine honored Ethel R. Lawrence Homes by choosing it as the site for the signing of the first set of amendments to New Jersey’s Fair Housing Act. Ethel R. Lawrence Homes also won the New Jersey Excellence in Housing Award in 2001. Praise for the apartment complex stems from its traditional town-house style design and special educational and social service support amenities as well as its storied history. Ethel R. Lawrence (1926-1994) has often been called the “Rosa Parks of affordable housing”. It took three decades of advocacy, citizen determination and litigation to build Ethel R. Lawrence Homes, NJ’s first affordable housing community in the suburbs to reach the very poor. Located on Moorestown-Mount Laurel Road, ERLH provides affordable housing to families generally earning between 10 percent to 60 percent of median income—or about $8,150 to $48,900 for a family of four (based on 2012 figures). More than 2,600 families, mostly from urban areas such as nearby Camden, have applied to live in the 140-unit complex. A number of our tenants have endured a waiting list that is today three to five years long. The namesake of the development was a woman who is known as the “Rosa Parks of affordable housing.” Ethel Lawrence was the lead plaintiff in the widely publicized Mount Laurel I (1975) and Mount Laurel II (1983), which stopped towns from shutting out the poor through exclusionary zoning. Peter J. O’Connor, one of the attorneys for the plaintiffs in that landmark case, founded Fair Share Housing Development in 1986 to implement the settlement agreement in the Mount Laurel litigation and began to develop a Master Plan for Ethel R. Lawrence Homes. The first 100 units were completed 14 years later in 2000 and an additional 40 units townhouses were built in 2004, completing Phase I of the project. Since ERLH first opened, the development has been a beacon of hope for families that have been historically prevented by racial and economic discrimination from having the opportunity to live in a safe community with good jobs and a top-notch school system. In 2003 Phase II of the project saw the opening of an 8,000 square foot Corporate Headquarters for FSHD to provide on-site management, maintenance and social services for Ethel R. Lawrence Homes and additional FSHD-sponsored affordable housing in Mount Laurel Township. Now Open - Phase III of the ERLH Master Plan: We recently developed 60 new housing units. ERLH III offers 36 townhomes for rent (1, 2 & 3-BRs). Robinson Estates consists of 24 single-family rental homes (2 & 3 BRs). An Outdoor Recreation Area will also be constructed soon. It will include playground facilities, a picnic area and wellness pavilion, and two lighted basketball courts. 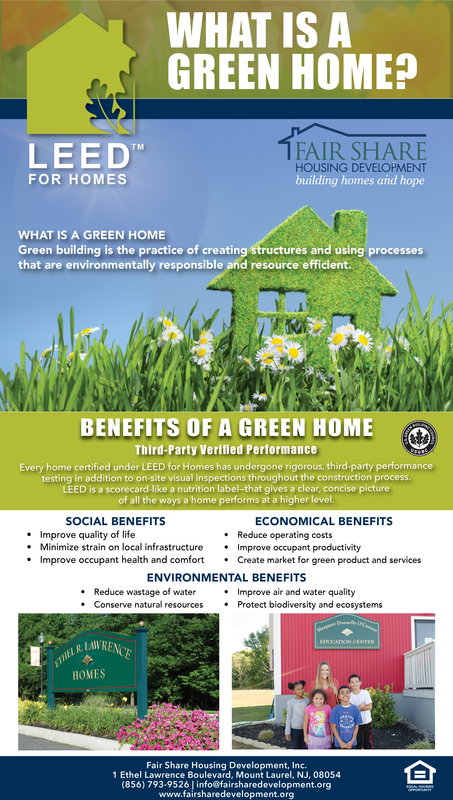 FSHD is seeking LEED certification for ERLH III and Robinson Estates. Phase I (A) (100 rental units) was completed in November 2000. Phase I (B) (40 rental units) was completed in March 2004. Both projects were financed by federal Low-Income Housing Tax Credits (LIHTC), New Jersey Balanced Housing Funds and Affordable Housing Program (AHP) funds from the Federal Home Loan Bank of New York. Fair Share Housing Development, Inc., purchased the land (62 acres) with proceeds from the original September 1985 settlement agreement in the Mount Laurel litigation. As part of amendments to the settlement agreement in the Mount Laurel litigation, Mount Laurel Township supported the construction of the $1.3 million 8000-square-foot on-site management, maintenance, and social services building, which was completed in 2003, and also serves as the nonprofit corporate offices of FSHD. FSHD and the Walters Group are pleased to introduce Phase III of the ERLH Master Plan: Ethel R. Lawrence Homes III (income-restricted) offers 36 townhomes for rent; Robinson Estates single-family homes consists of 24 homes (income-restrictions and rental restrictions apply). Applications will be available online on Monday September 25. You can also pick one up at our office: ERLH, 1 Ethel Lawrence Boulevard, Mount Laurel, NJ 08054. Coming soon: we have final site plan approval for an outdoor recreation area that will include a playground area, two lighted basketball courts, a picnic pavilion and wellness facility. Construction is expected to begin in late 2017.